While the Chronicle and Echo was not launched until 1931, The Mercury first came out on May 2nd 1720, making it one of Britain’s oldest continually printed newspapers. 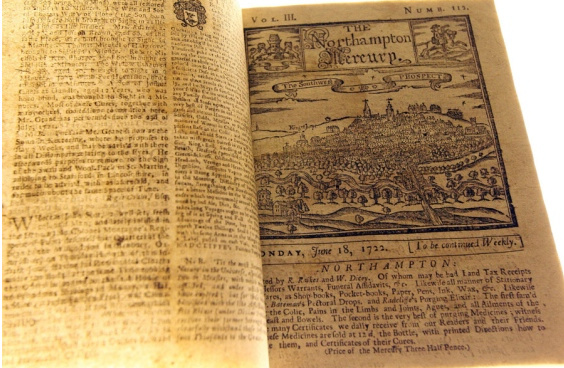 In the 1700s however, very little news in the paper was about Northamptonshire. Instead, most reports focused on events happening in London and abroad.The newspaper did however feature a weekly list of the diseases people had died from that week, with the 21 August 1722 edition showing consumption, convulsions, ‘griping in the guts’, smallpox and ‘teeth’ were among the big killers of the time. Ever Since 1772 the Northampton Mercury has been printing newspapers or documents reporting on our county news whether its a simple wedding right down to a Ghastly Grizzley Murder, and there were many in the 17th & 18th century. How else would we get the news ? And notice how different the wording is on pre 1900 reports. 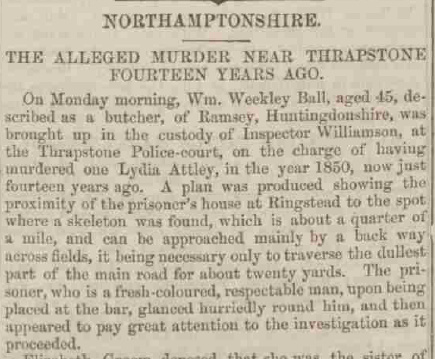 1850 and the Lydia Attley disappearance and all was let loose, week after week the Mercury was writing about this story and even on the final trial day there wasn't a conclusion to her disappearance. When reading through old papers it seemed bad news sold more copies that good, even today times haven't changed that much. There was of course Royal news and news about weddings and village feasts or carnivals and so fourth. Then came the World Wars and so lots was reported about these in much detail. I must apologise before I go any further as headlines or village stories about Ringstead were mostly slightly down beat and very sad and it seems happier events in the village got very little or no mention. When you ask outsiders “Have you heard of Ringstead” you get many different replies like, “Oh that's the place where you have a nice lake and mill” or “oh yes I've visited Dodson and Horrell shop” or even maybe “Oh yes we've been to a pub there” in earlier years maybe it was “Oh you have a great fish and chip shop there” Every one has a different memory of Ringstead. To be honest Ringstead is not much different to any other village such as Denford or Addington, but slightly bigger in population. It was reported in the Mercury Newspaper in 1918 that Ringstead had its fair share of suicides and murders, more than any other local village. This was noted in the summing up of the Harry Cope murder enquiry or inquest. Of course Ringstead does have many good qualities in a village. Although it seems we have lost some lovely buildings over the years including the recent loss of the New Inn public house. Even the former Boot & Shoe factory at Denford Road seems doomed to be flats and over the years we've lost many shops. Many would call this progress. It was a thriving, self- contained village in the 18th Century and now like so many villages most people have to travel to bigger towns for work. From the early 1800s the village had always had sport and football taking the lead but there was hockey in the 1950s held at the recreation ground, there was tennis, both male & female teams and cricket in the early part of the 1900s Ringstead had a top team and won many prizes. Even the school had a netball team so all kinds of sport in the village were participated in. To the older generation of the village who can remember the hermit who lived at the woods at the bottom of Ham Lane In what we used to call Ash’s wood where Ashley Sydney Bull lived out his life. Born in 1894 and died in 1982 Ashley Bull was quite a clever man, born in Ringstead, went to school in Ringstead and lived firstly in a terraced block of three which have since long gone but stood opposite the church. Ashley was a very quiet person, kept himself to himself and in his own way a proud man. He joined the Flying Corps as a mechanic in his teens was a very good boxer and football player. He did learn the trade of a tin smith as one time his father once was..
was just a few shack type huts and one 6x4 tin shed stood and where he was to live for 37 years. Little did he know that for all those years that was going to be his home for ever! ​ After a bad winter, Ashley Bull succumbed to the cold and In 1982 and very old he got frostbite to his leg, there was a day or so where no one had seen him in the village shop or about the village so someone decided to check on him. He was discovered sitting in his chair barely alive and its said it took quite a few minutes to get his body out of the tin hut. He was taken to Kettering General in an ambulance and ended up having his leg taken off due to frostbite. He never pulled through well enough and died a few days later in hospital. We do know that Ashley was seeing a girl prior to Ww1, she was Annie Richardson, a seamstress for the Ideal clothing factory Raunds but when Ashley arrived at Ringstead railway station assuming his sweetheart was there to meet him but soon disheartened later finding out she had gone off with another man. ​This really upset Ashley and we think played a part in to how he played his life out years later. Many do not know those very woods where he lived was once a beautiful Victorian garden and many a traveller visited in the early 1900s to admire the gardens. 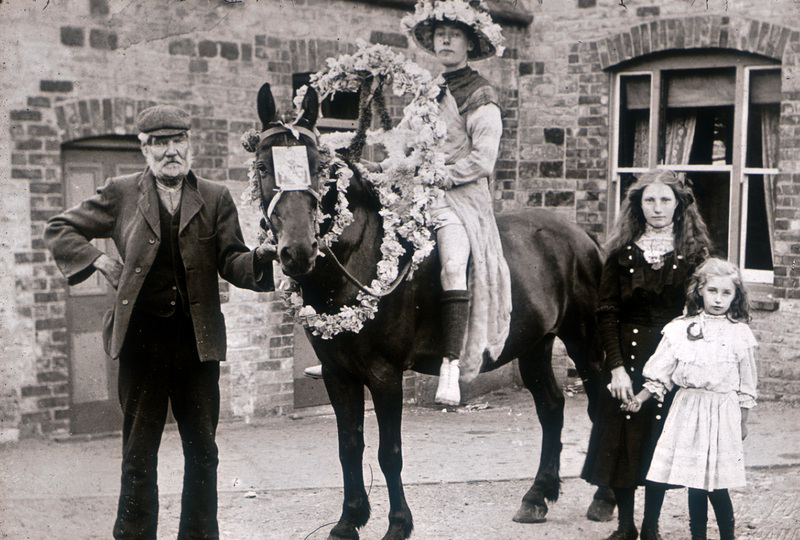 Below on the right is Ashley Bull posing in the Ringstead football club outfit and sitting on the horse and to his left is his father Tinker Bull. The village school in year 1900 had a young lad with the name of Alfred Roberts who when later in life married had quite a famous daughter “Margaret Thatcher”. The village football team had the pleasure of having Sir David Frost as a teenager playing a season with Ringstead Rangers football club and was known to pop in The New Inn for some refreshment. 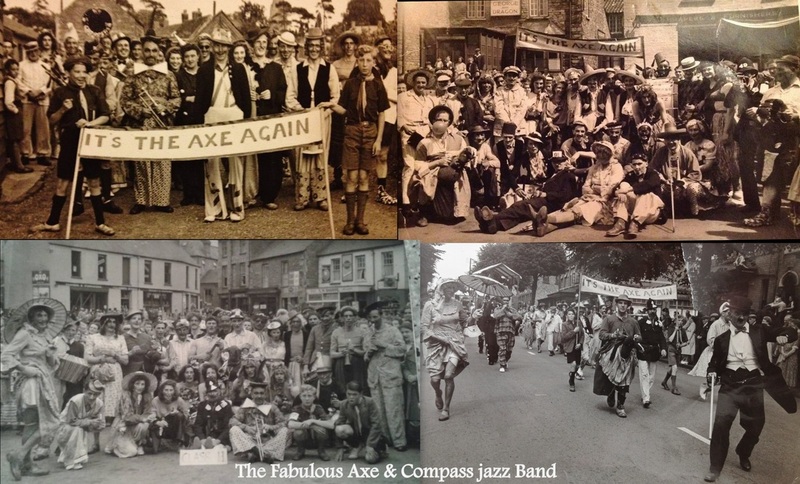 Below from the 1940/50s there was the Fabulous Axe & Compass Jazz band. Although the need for dressing up wasn't imperative it added to the fun and glam for the occasions of carnivals and concerts all over the county. Ringstead jazz team had some very good musicans at the time and it was just pure fun when these guys were playing. The following stories are from Ringstead people and about their life growing up in this lovely village. A Thrapston court judge once said that “Ringstead" has had more bad luck and tragedy than any other village or town when it comes to self-inflicted death”. This story about Harry William James Cope reflects that view. James Cope and Jane Hillson were married in 1862 in Ringstead and had several children, including Harry William James who was born late 1877. Tragically Jane died aged 35 years, in 1881 very soon after the birth of their daughter Ruby. In 1881 James was an army shoe maker. 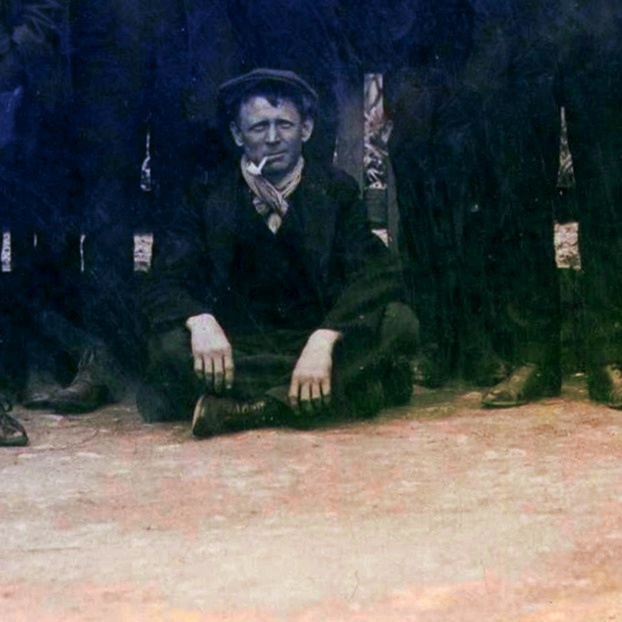 By 1891, his son Harry, aged 13 years, was working as a boot closer and by 1901 was also a shoemaker. In 1886, James subsequently married a second time to Lucy Bird. 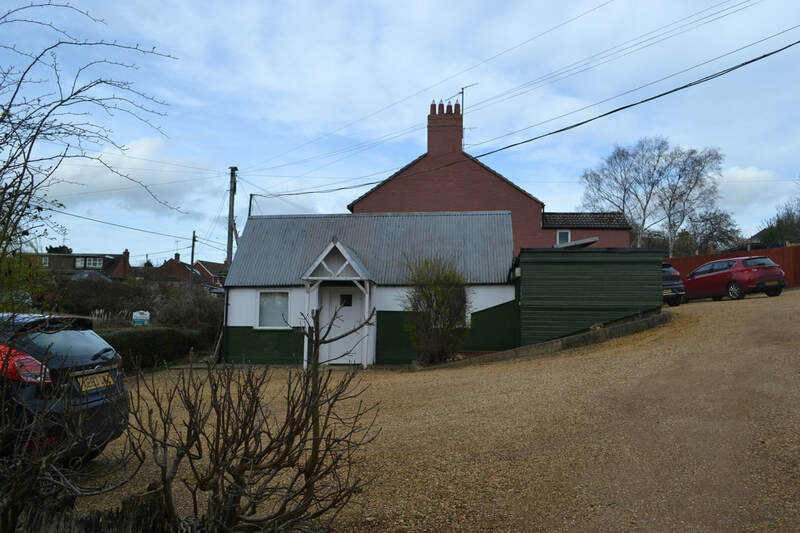 In early 1909, Harry married Lucy Bird and they moved to their new home in London End Cottage, Ringstead. 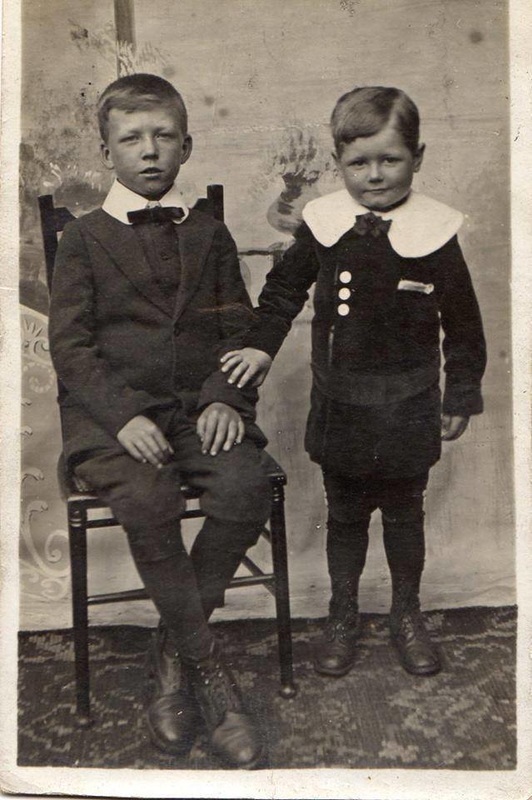 Their family began with Reginald who was born in 1909 (but who probably died sometime after the 1911 Census), followed by Harold in 1910 and Ronald in 1911. 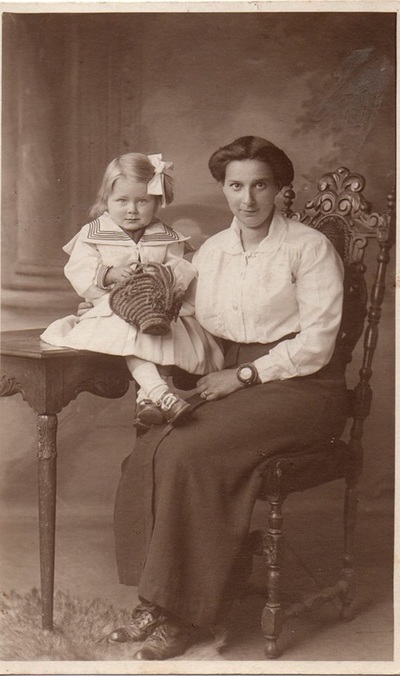 Lily, their daughter, was born in 1916. In 1917 the couple resided across the road in a cottage from London End Road cul-de-sac. The cottage is still there now but has been added too over the years. Its thought that the cottage when first built was a beer house. After a short time Harry and the family moved just over the road from London End Road to Back Lane, just a stone's throw away but reason is not known at this point in research. Lucy suddenly became ill towards the end of 1917 and quickly died after suffering a terrible fever. Harry was left a widower with three children. Harry was working for the Regulation Boot Company in Raunds and would have been well aware of the terrible conflicts in World War I. The Military Service Act in 1916 had enabled the British Government to begin conscription for single men aged 18 to 41 years old. Exemptions were allowed and so a system of Military Service Tribunals was established to adjudicate claims on the grounds of civilian work of national importance, domestic hardship, health and conscientious objection. Later in 1916, because of the need for more men, married men were included on the list for the first time. So until then Harry would have had no concerns about conscription and would have been satisfied to have been working in an industry that supported the armed forces. However, from the autumn of 1916, Harry would have been eligible for conscription but to his no doubt relief, he wasn’t immediately called up. 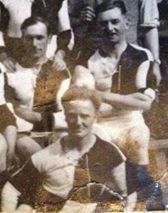 It is possible that Harry received his call up papers the following year, around the time that his wife died and so understandably did not immediately lodge a claim for exemption. When his claim was finally received by the tribunal at its meeting on 14th February, 1918 the military representative ruled it out of order as a late appeal. The Tribunal however asked that Harry should be graded, to see if he qualified for exemption. Harry would have left that Tribunal very worried. It would have seemed to him that he could be called up and the welfare of his three children would be at risk. 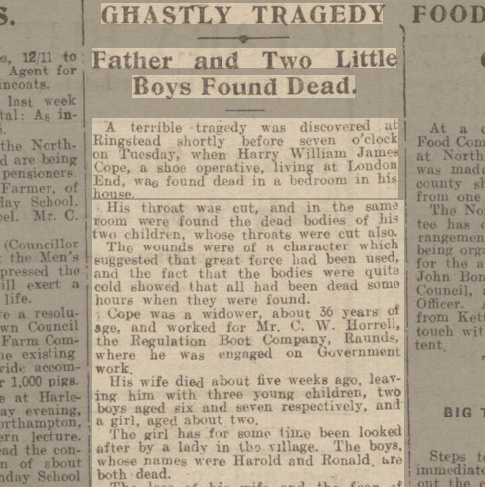 Four days later, on 18th February 1918, after days of anguish about what would happen to him and his family he finally snapped and he murdered his two sons by cutting their throats whilst in bed and then committed suicide himself. The dreadful scene was discovered by a friend (Harry Adams) who managed to break in after looking through a small gap in a window. At work that day it was on his mind that much and after his usual dinner break at his sister’s house in Raunds he biked back early to the house saying he wasn't feeling very well, He must have prepared himself mentally for the task he was about to commit later that day. He picked the boys up from Ringstead school which was very unusual, prepared dinner and soon after dinner he sent the boys to bed. According to a witness harry at 9.30 went to a friend’s house get a bucket of water from there well and returned home .The witness noted he was in his good cheerful self. Harry had bolted both doors and locked the shutters so no one could enter. On the following day a fellow shoe maker Harry Adams on walking by the cottage noticed something was very odd with all the shutters closed down and then immediately went over and looked through a small gap in one shutter and began shouting Harrys name. He knew something was not right and broke in, he found Harry on the side of the bed next to both the 6 & 8 year old boys. There was evidence that the elder boy gave a struggle with his father as there were many cuts to his face before the final stroke of the blade. His daughter, 2 year old daughter Lily, was being looked after by Mrs Judd, a friend of the family. She ended up going o the children’s home in Raunds . I tracked Lily Cope (her named changed to Mayes) down where she went to live with a family in Birmingham and she died in 1992 a single woman living on her own. She would have not known any thing about her father or her brothers. There are two living relations to Harry, one is Ringstead man Alan Mayes at Spencer Street Ringstead and a lady in Stanwick who is the granddaughter to Harry's sister Maggie Cope. The funerals were held the following week and the streets from Back Lane to the chapel were lined by crowds of people waiting for the hearse cart to go by so they could pay their respects. Many had come from Thrapston, Raunds and the Addingtons. As the procession drove by with hearse and cart hundreds of flowers were thrown on to the coffins of the hearse.. In summing up on why Harry killed his boys, it is often known when a person is in a worried mental state he may take his loved ones with him as this has happened in many cases before. Below is the Mercury newspaper write up on the Cope tragedy. Please click on each image to expand. Pic 1 is Ronald & Harold pic 2 is Harry Cope,pic 3 is a news paper clip from 1918 & pic 4 is Lilly Cope with her baby sitter on the night Ada Judd. Born in 1915 George Evans of Ringstead after school decided his trade was going to be a butcher, but upon reaching the age of 24 and in 1940 he was conscripted into the army and in the link below is George's war story. Below is the dashing looks of George Evans. Please click the link. And whilst on the subject of war and Ringstead and to give my own family recognition my very own father was caught up in WW2 just like George, they actually new each other very well with George 2 years older that my father Leonard Abbott. But Len was a paratrooper and was dropped behind enemy lines avoiding snipers on the long push to Berlin, he lost many army friends by snipers and was very lucky to survive the War. Edward Teddie Abbott who fought in Ww1 in France made friends with chap in the trenches, his name was Charles and after the war ended Edward kept in touch with his friend he met for many years after the war by writing to each other but as time went on the letters slowly dwindled but years later this particular Charles went to acting school and went on to make films such as Munity on the Bounty and Hunchback of Notre Dame and he was none other than Charles Laughton possibly one of the top actors of the 1940s and 1950s. Lydia Attley was born about 1821 at Ringstead, Northamptonshire, the daughter of William Attley and Lydia Whiteman. In July 1850, during the latter stages of her pregnancy, she disappeared from Ringstead and was never seen alive again. The villagers were suspicious of butcher William Weekly Ball and there was a consensus of opinion that Lydia's disappearance had been down to him. He was harrassed so much in the village that he eventually moved away from Ringstead. Some 14 years later, a skeleton was discovered in a field at Ringstead. It was immediately believed to be the remains of Lydia Attley and William Weekly Ball was brought before the police and the courts charged with her murder. The following extracts are taken from newspaper reports at the time detailing the discovery of the skeleton and subsequent charges that arose. The court story tells of his arrest and what exactly what was said in court,and then to his release. He finally moved away. 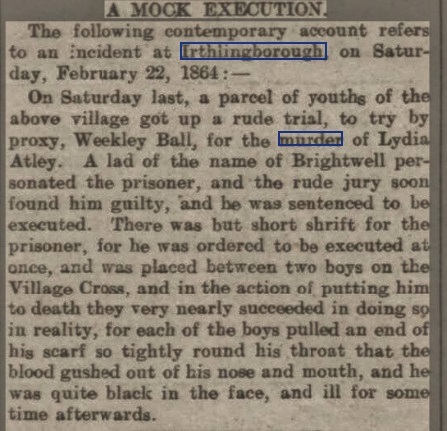 But this isn't where the story finishes, because the article was widespread all over England many Northants people were getting quite sick and fed up of the story to the point where people in Irthlingborough actually had a mock trial of William Ball. A group of lads in the town and on the cross in the centre of Irthlingborough convicted a young man in the mock trial. He was then promptly found guilty and actually had a rope put around his neck and made to hang as in real life in this mock trial and then the jury of boys ran off leaving him dangling on the rope. However, something went totally wrong and he was left swinging on the gallows, but no one went to his aid until it was nearly to late. He blacked out within seconds and the colour of his face was fully purple and was just seconds from death when two boys returned to cut him down. Which now beggar's the point if they did this for fun what did they do if youths of this time do if they got annoyed. Stanley was called up for active duty in 1940 at the age of 21, joining the 11th Indian Division of the Royal Corps of Signals and after initial training he left for Malaya on 2nd January 1941, his Mum’s 66th birthday. In his letters to his family in December 1941, he wrote how he had desperately wanted to be at home that Christmas, but didn’t want to run the risk of losing his newly awarded lance corporal stripe and increased pay, by taking more than the one day’s leave he had been granted. After the fall of Singapore on 15th February 1942, he was transported to Taiwan by ship and imprisoned in Taihoku POW Camp 6 on the north of the island. For over a year his family did not know whether he was alive or dead, however they eventually got news of his whereabouts in the summer of 1943. Conditions in the camp were very harsh, but the war in the Far East finally came to a end when the Japanese surrendered on 12th August 1945 . 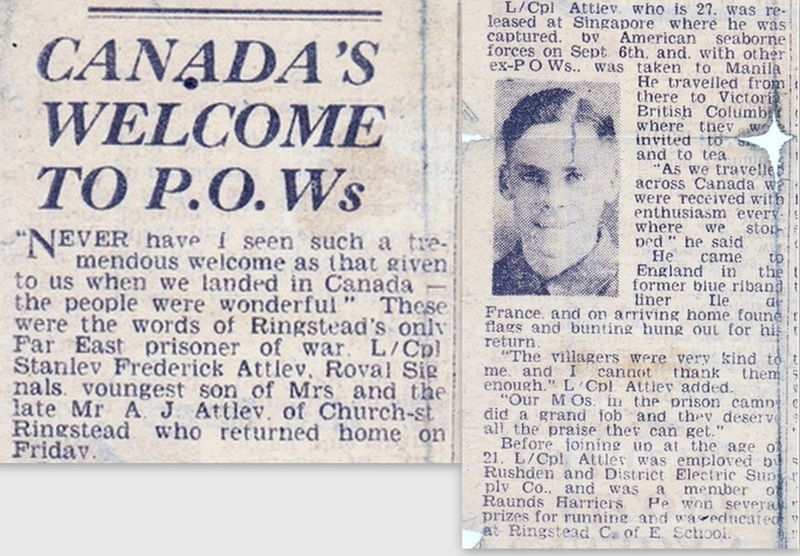 Stanley describes his journey home and the kindness shown by the local Villagers on the island in this cutting from the local the paper in late 1945. In an age when we take world-wide travel for granted, it’s amazing to think that Stanley never left the British Isles again - “I don’t feel the need to “, he would say….”I’ve been round the world”. He had sailed out to the Far East via the Indian Ocean and returned across the Pacific, Canada and the Atlantic. His experiences in Malaya and his suffering as a POW in Taiwan were to have a lasting effect. He very rarely talked about what it was like, however he would often say thank you in Japanese,(Aregato) and count to 13 (Ju san) his roll number in the camp. Below is a photo of Stanley and Mary Attley with George Evans. They were receiving certificates from Michael Peacock for their work in raising funds for the Poppy Appeal. 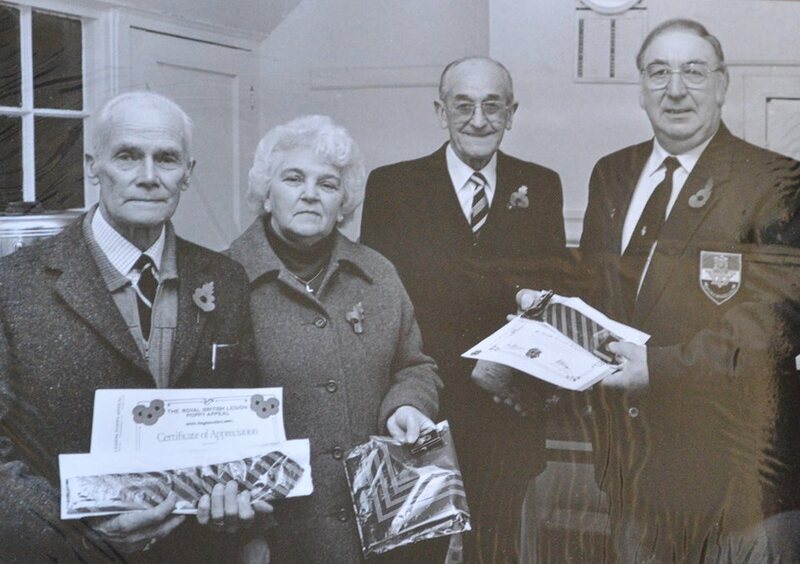 Stanley was the Poppy Appeal Organiser for Ringstead for many years. Alfred Roberts was born in Ringstead Northants. He was the fifth of seven children. His father was Benjamin Ebenezer Roberts (1857–1925), from a Ringstead family, and his mother was Ellen Smith (1857–1935), whose own mother, Catherine Sullivan, was born at Kenmare in IReland. Ellen's eldest two known siblings were also born in Ireland and her twin brothers in England in 1852. The gap in age between Alfred's aunt Mary and his uncles of around nine years coincides with the great famine and it more than likely meant that other siblings perished through starvation or associated diseases. His grandparents possibly left Kenmare between 1849–51 and like two million more came destitute to England. This and the family's hard times may have much to do with the reticence to acknowledge his being part Irish to his daughters. Roberts' bad eyesight meant he could not enter the family trade of shoemaking. He left school at thirteen in order to help support his family and is listed in the 1911 census as living as a boarder in Oundle, Northamptonshire, and working as a grocer's assistant. He later moved to Grantham, Lincolnshire, where he gained a job as an apprentice in a greengrocers he had originally wanted to become a teacher. When the First World War broke out in 1914, Roberts, "a deeply patriotic man", applied to enlist in the army six times but was rejected because of his poor eyesight. Margaret Roberts as a child lived at Oundle and visited her Grandfather in Carlow Street in the school holidays . It has been passed down that even at a early age of 12 she would organise the various groups or gangs down that end of the village and many of her age despised her for interfering with the proper and organised groups of the village. When she was older and in mid-term in office as the Prime Minister she visited the village and in particular the cemetery where Alfred is buried. She also made a donation by presenting a cheque to the church, figure unknown. Only two people in the village saw her on this visit as it wasn't broadcast. 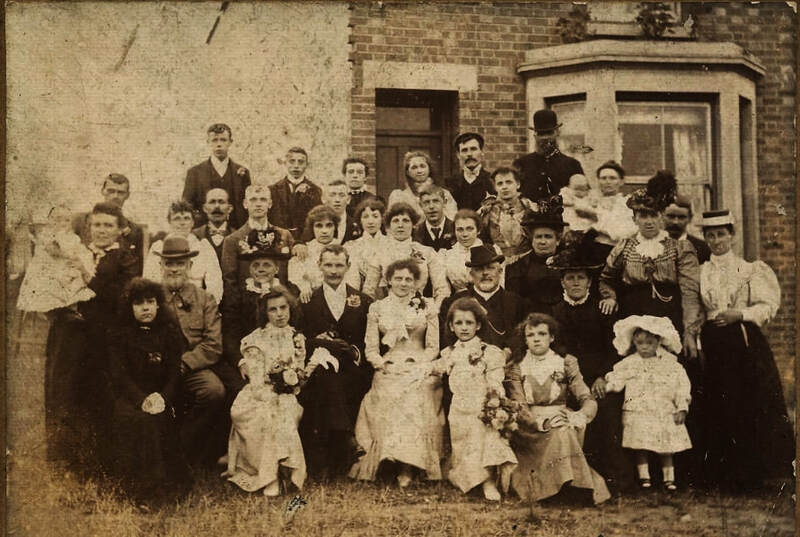 The Roberts family of Ringstead were quite a large family, and apart from Margaret there was a John Roberts who was a organ builder in the village and a vocalist in the Baptist church choir. Benjamin Roberts another shoe maker and brother to Alfred had a very sad ending to his life. At the age of 60 years old began having fits and soon become very Ill, he had moved to Wellingborough at this time and decided to end his life by laying in front of a train at Irthlingborough station , he thought the next train was a through train and wasn't to stop, how ever, It did and pulled in slowly and pushed William body just a few yards, result was just bruising and cuts. He was then sent to Thrapston court for the charge of committing suicide,an offence, the judge was lenient on him and dropped the case. 6 years Earlier in his life when living at Ringstead he started the sick benefit club, which existed for many years. 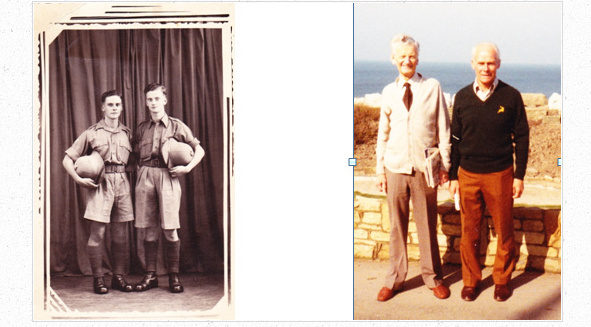 Pod cast story of Alfred Roberts,-please click to listen about his life. William Roberts was born in about 1767. He does not show up in Ringstead Registers and it is rumoured that he came from Wales. We first see him in Ringstead when, on 12th October 1788, when he married Ann Roberson in the parish church. What we do know is that less than two years later William was involved in a dispute. It was on Tuesday 18th August 1801 and the harvest was in full swing. At some point William and another labourer, Matthew Teat, began to row. Whatever the cause of the argument, it soon became heated and burst into violence.The harvest field was known as a place of flirting and ribaldry. A line of men with scythes needed to work together in a rhythm if they were not to get in each other's way or cause injury. It may be some jealously or just in the heat and toil of the cutting with scythes, one of the men, either as a joke of by accident clashed scythes with the other. Whatever the reason, the two men began to strike at each other with their scythes which would have been sharpened like razors to make the work as easy as possible. We can only surmise at the exact way that the men fought but we do know that the two of them hit out at each other just two or three times with their scythes. This was not two hot headed youths fighting, for William was about 34 and Matthew was some eight years older. The nature and place of the injury seems to indicate that the two men were using the whole scythes and not just the blades. Can we imagine William, suddenly distraught, watching his adversary's life blood staining the just cut stubble? Were any final words exchanged as the wounded man lay there, slowly dying? Words of some kind must had been exchanged,Matthew Teat was buried two days later, on August 20th1801, in the Ringstead churchyard. William Roberts was convicted of manslaughter and was severally fined one shilling and ordered to be imprisoned in gaol .This seems amazingly lenient, especially when we see it in the context of the other cases. William had probably been in custody for the five or six months leading up to the trial which would have been taken into account. This was a long period from ofence to trial, for the criminal law was often quick if not always fair. Why was the sentence so lenient? Was it felt that the provocation was extreme, or that it was done in the heat of the moment with both men equally involved? Was it because it was a scrap between two labourer's that went wrong? If William had killed a "gentleman" in similar circumstances one suspects that he may have paid with his by swinging from the gallows at Northampton castle or Assizes or at worst or found himself on a prison ship bound for Sydney bay Australia for life like indeed like my own grt x3 Grandfather in 1832 did for simply poaching. William died on 3rd April 1836 aged 69 years -by D Ball. So who were the Tuttle’s ? We start in the year of 1482 with a Humphrey Totehyll born in Staffordshire, he is the earliest ancestor in England, prior to this his parents were from Ireland and their farm recorded in the doomsday book which was a census on land owners. It must also be said that prime minister Winston Churchill was a descendant at this point. From Stafford the family move to Woodford Northants, and after this Ringstead.Humphrey married circa 1505 to Maud (last name unknown) and possibly died in Woodford, Northampton, England. The son of Humphrey and Maud was Thomas Totehyll born 1506. The name Tuttle has appeared in numerous forms throughout history. Some of the various name compositions have been Tuthill, Tuttill, Tutoll, Tutthil, Tutle The name is not, however, English. It is an Irish name. Our branch of the Tuttle Family Tree begins with the most distant direct line ancestor discovered to date. This “First family,” so-to-speak, is Humphrey Totehyll, born 1482 in Staffordshire, England. Humphrey is the earliest ancestor discovered to date, however, there are records of scattered individuals, who may or may not be part of our family line, as far back as the Doomesday Book, which was a census of landowners taken in the 11th century. Nothing is known to date regarding his parents or much of his life. He married circa 1505 to Maud (last name unknown) and possibly died in Woodford, Northampton, England. WILLIAM Tuttle was born December 24, 1607 in Ringstead, Northamptonshire, England, and died June 16, 1673 in New Haven, New Haven Connecticut and was a handy man in the village. William Tuttle came with the first settlers of New Haven in 1639. on the “planter” ship. He was the Son of Symon Tuttle and Isabel (Wells) Tuttle. 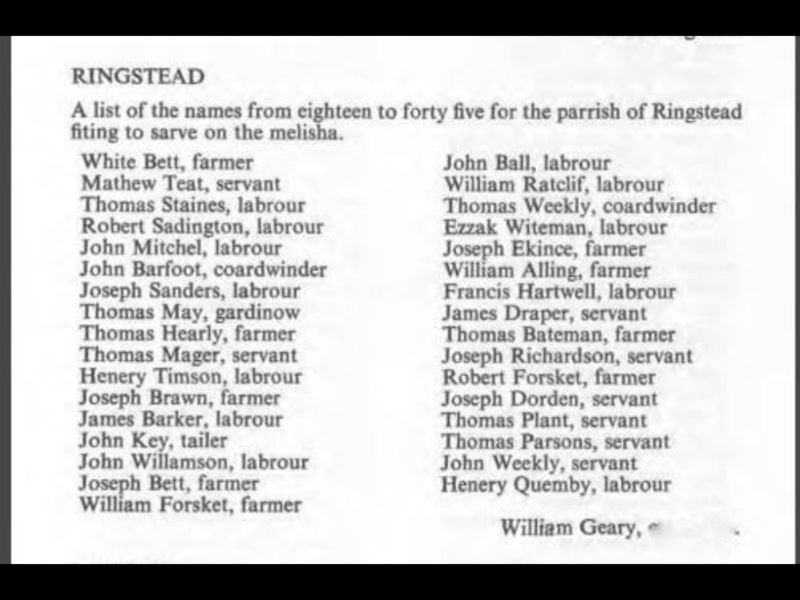 Isabel father was John Wells of the Ringstead Gift/charity. The first son and fourth child of Richard and Elizabeth was Symon Totehyll (although he was known to spell his name “Tootill” and “Tootell,”and even Tuttle among other variations). Symon was born in 1560 in Ringstead, Northamptonshire, England. In 1595, Symon married Isabel Wells, the daughter of John and Elizabeth Wells (John Wells was born in 1530 in Ringstead, Northamptonshire, England; and Elizabeth Wells was born in 1532). Isabel was born in 1565 in Ringstead, Northamptonshire, England, and she was baptised March 11, 1565 in Howden, Contesse, York, England. Symon and Isabel brought forth seven children in to this world. Symon passed away on June 15, 1630 in Ringstead, Northamptonshire, England, and was interred there as well. It was with this generation of children, the children of Symon and Isabel, that the Tuttle family uprooted themselves and joined the burgeoning emigration movement toward to the New World. The period of time between 1629 -1640, was an important part of the history of this country. Scarcely more than a decade in length, this time period is known as the Great Migration. England was on the verge of a great civil war, and emotions were intensified by religious animosities. The outcome of these turbulent times was uncertain and unpredictable, but they would almost certainly bring widespread calamity, ruin, and death upon the land. With the establishment of the Plymouth Colony, came a way to escape this impending disaster. A 3,000 mile ocean voyage to a largely uncharted and unknown land. Those who chose to embark upon this journey were certainly not lacking in courage. They were well aware of the hardships and dangers awaiting them. The fear of the unknown was surely great. Of those participating in this Great Migration to the New World, the more cautious and prudent, those having the strongest attachments and largest investments at home, would naturally be the most reluctant to leave. And so it happened that the later emigrants, those who came between 1635 and 1640, were comprised of a larger proportion of the higher classes than the earlier emigrant expeditions. It is both possible and probable that the Tuttle’s had discussed the emigration of their fellow countrymen to New England. Perhaps they even planned to make voyage themselves. Between the years of 1630 and 1635, a mere five year span, the family suffered the loss of the family patriarch, Symon, as well as four of his children: Dorothy, Thomas, Simon, and Anne. It is likely that the passing of five family members in only five years served to be a deciding factor in the family’s decision to emigrate to the New World. Isabel, the wife of Symon and mother of Richard, John, and William, passed away after reaching the New World, and she was buried in Rumney Marsh, Massachusetts. The date of her death is unknown at this time. In April 1635 Simon’s sons Richard and William left Ringstead with their families and their mother Isobel. They joined their brother John and his family, who had been living in St Albans, on a voyage to New Haven on the ship “Planter”. Also on the ship were George and Jane Giddings from Ringstead, ancestors of the present Ringstead family of Abbott. 1. Dorothy Tothyll, born around 1592, in Ringstead, Northamptonshire, England. The date of her death is unknown. She married James Bill, around 1626, in Ringstead, Northamptonshire, England. 2. Richard Tothill, born in 1593, in Ringstead, Northamptonshire, England. 3. Thomas Tothill, born in 1595, in Ringstead, Northamptonshire, England. He died sometime before December 19, 1627, in England. He was married to a woman named Anne (last name unknown). 4. John Tothill, born around 1596, in Ringstead, Northamptonshire, England. John was baptized June 4, 1596 in Holcot, Northamptonshire, England. He married Joan Antrobus in St. Albans, Hertfordshire, England. Joan Antrobus was born before June 25, 1592 in England, and was baptized June 25, 1592 in St. Albans, Hertfordshire, England. She died after January 29, 1660/61. Mrs. Joan Tuttle was attorney for her husband, then living in Ireland. Together with his wife, and his brothers William and Richard, and their families, came to America in 1635 aboard the ship Planter, and settled in Ipswitch, Massachusetts. Joan Antrobus was first married to Thomas Lawrence, and with her brought her three children from her previous marriage to America. These children were John, Mary, and William Lawrence. John Tuttle (Tothill) later returned to Ireland, and died there on December 30, 1656, in Carrickfergus, Ireland. 5. Simon Tothill, born in 1597, in Ringstead, Northamptonshire, England; and died on December 14, 1630, in Burton Latimer, Northamptonshire, England. Simon was married twice, first to Alice James, in1616; and second to Kathryn Babcock, on June 26, 1624. 6. William Tothill, born December 24, 1607, Ringstead, Northamptonshire, England; and died June 1673, in New Haven, Connecticut. 7. Anne Tothyll, whose birthdate is unknown. She died sometime before 1627, in Ringstead, Northamptonshire, England. Richard Tuttell (which is one of the many ways Richard spelled his own last name), the eldest son of Symon and Isabel Tootell, was born in 1593, in Ringstead, Northamptonshire, England, and on June 22, 1622, Richard married Anne Taylor (born 1594) in Bramwell, St. Albans, Northamptonshire, England. (Richard was married twice. He was first married to Joan Grafton, however, the date of that marriage unknown). For several years Richard and his family lived in England, until the stress of impending civil war as well as other societal problems encouraged the family to leave England. On April 2, 1635, at the age of 42 years, Richard Tuttell, his wife Anne and their family, along with his brothers John and William and their families, and also their mother Isabel (at age 70 years) boarded the small barque Planter, captained by Nicholas Trice, and embarked on a three month voyage across the Atlantic ocean to a new land, a new home and a new beginning. They arrived safely at Boston, Massachusetts on Sunday, June 7, 1635. Also joining Richard, his mother, his brothers and their families, was Maria Bill, age 11. Maria was the daughter of Richard’s older sister Dorothy and her husband James Bill. Dorothy had passed away during the previous five years. Later, in the same month, Maria’s father James Bill, and her older brother John Bill, aged 13, arrived in Massachusetts aboard the ship Hopewell. James Bill died in Boston in October 1638. On May 27, 1635, the 240-ton barque Angel Gabriel, left England. It was wrecked August 15, 1635 offshore of Pemaquid Point, Maine, in what was described as a “great storm” (possibly a hurricane). The ship’s captain, Robert Andrews, and many of the passengers were rescued, including a cousin of Richard Tuttle, one John Tuttle, born circa 1618 in Devonshire, England. This John Tuttle, who later settled in Dover Neck, New Hampshire, has since been known as “Shipwreck John Tuttle.” For 150 years, all of the Tuttles of New Hampshire were descended from him. Richard and his family settled in Rumney Marsh, Massachusetts (which later became known as Chelsea, Massachusetts), while his brother William settled in New Haven, Connecticut with his family (for more on William’s family, see the Terrible Tuttle’s elsewhere in this section), and John settled in Ipswitch, Massachusetts. It was later recorded that John left America and “went back” or “returned” to Carrickfergus, Ireland where he lived out his life. The fact that it is recorded that he “went back” or “returned” to Ireland would seem to validate the Irish origins of our family. In March of 1636, one year after arriving in New England, Richard was admitted as a member of the church, and in the same month, he was chosen to serve as Selectman in Boston, in order to oversee and regulate (along with other Selectmen) the internal affairs of the town. On November 5, 1638, Richard took up the responsibility of keeping law and order in Boston when he was elected to be the Chief Constable of Boston. This same year he became a major land owner in the area when he received an allotment of 161 acres of land at Rumney Marsh, Chelsea, and Pullen Point, Massachusetts. (Note: Rumney Marsh and Chelsea were later combined and incorporated as Chelsea, Massachusetts.) This land allotment was added to Richard’s other holdings which eventually included a 394 acre farm, an 84 acre lot, and a 50 acre lot. It was in 1714, on a portion of one of these lots, that the building later known as “The Old North Church” was built. As you will remember, it was from the tower of the Old North Church that signal lights were shown to indicate to George Washington’s Continental Army from where the British Army would be advancing. This historic signal, “one if by land, and two if by sea,” marked the start of the American Revolution. Richard was a responsible member of the community, and was noted as contributing financially for the maintenance of a local school teacher. Richard died on May 8, 1640, at the age of 47, in Boston, Suffolk Co, Massachusetts. His widow, Anne, later married their good friend Edward Holyoke, the father of Mary Holyoke, wife of their son, John Tuttell. Sargent Samuel Nichols was one of the fifty men of the Royal Horse Artillery who lost their lives in the Waterloo Campaign. He had joined in 1795 aged 18 years and served with the Troop through the Peninsular War, seeing action at many of the great battles from Bussaco in 1810 to Toulouse in 1814. At Waterloo he served in D Troop under the command of Captain George Beane, who was also killed. John Phillips fought in the 69th Foot, in Number 2 Company (the same as Thomas Harrison of Kings Cliffe), and survived the slaughter of his regiment at Quatre Bras only to be struck by a musket ball in the left shoulder two days later at Waterloo. His military career was short – having enlisted in 1813 aged 20, his Waterloo wound caused his early discharge in 1816, which perhaps meant his arm had been amputated..
​Whilst on the subject of the Battle of Waterloo In 1913 a film was made at Irthlingborough capturing the event In 1815, there was thousands of extras used in the making of this film and as the daily pay was very good many Ringstead & Raunds men left there own job and worked as extra's. 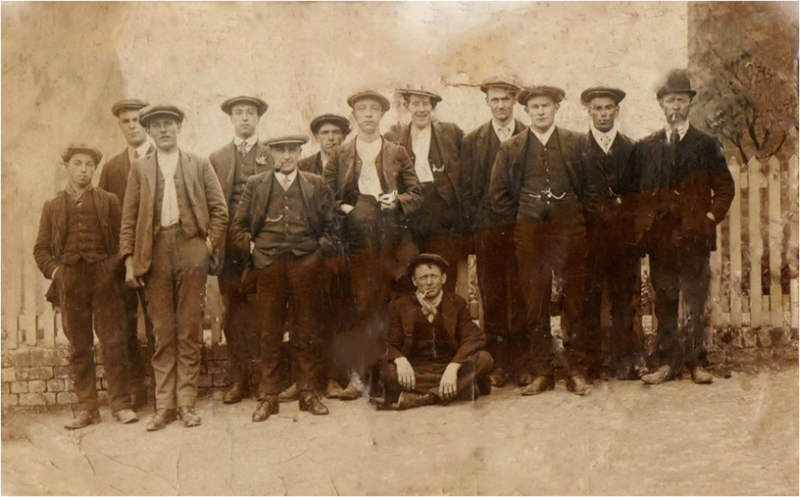 The film was captured both in Irthlingborough town and down the Nene valley as far as Cotton mill and a handful of Ringstead men took part. William Roberts was born in about 1767. He does not show up in Ringstead Registers and it is rumored that he came from Wales. We first see him in Ringstead when, on 12th October 1788, when he married Ann Roberson in the parish church. Charles Burgess was born in Raunds, his parents were Thomas and Ellen Burgess. His father, Thomas, was a tailor up Arnsey hill (Manor hill).In 1883 Charles was awarded the Queens Prize from the Science and Art Department, South Kensington, which was a forerunner of what is now Imperial College University, London. 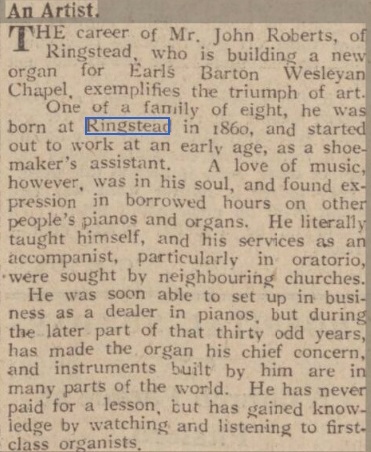 This prize was a very high honour indeed.In 1884 Charles Burgess appears to have been a proficient student, as the following newspaper clipping from the Northampton Mercury confirms. In 1891 Charles Burgess was living in the Barking Area and his occupation on the census was listed as an Elementary School Teacher.By 1900 he was appointed as an Assistant Master at Fratton Boys School, having left his previous school, Wellington Place, where he had been a First Assistant teacher. By 1901 Charles Burgess was living in the Portsmouth area and was listed on the census as a Certificated Master. In 1925 Mr. Burgess married an Elizabeth A Wyman and they settled in Ringstead house in 1926 and said to taught at Ringstead school for a short period as a relief teacher but In 1945 Charles's wife Elizabeth died, and this was when he decided to sell all his worldly possessions and enter a monastery. Mr. Burgess eventually died in 1953, at the time he was living at the Nashdom Abbey in Burnham Buckinghamshire. Below Charles is on the left on this 1930s carnival day. 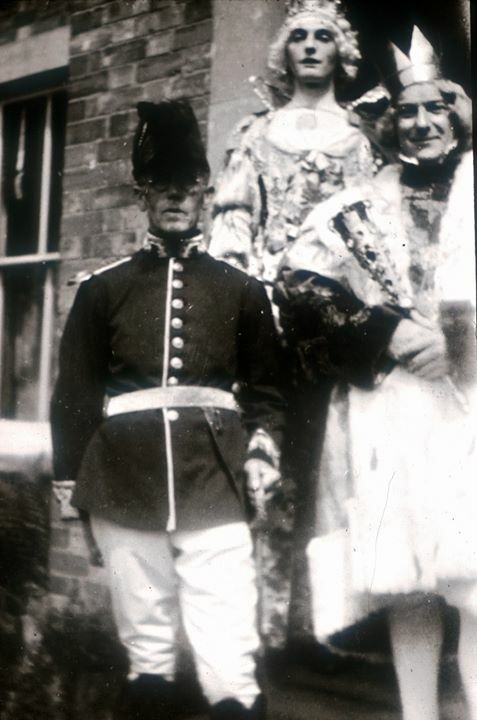 The other two are men dressed as women as did many on Ringstead carnival days. Frederick James Fox 1880 – 1954, of Ringstead, was the youngest of ten children living at Leveratts Row. His father, Joseph, was a shoemaker and one imagines this trade was passed down to Fred. He would have gone to Ringstead School up to the age of 12 and soon after leaving school he would be learning his father’s trade of shoemaking. Later on he met his wife to be, Bradford girl Mary Gray, and once settled down started his own family, having 5 children with Mary. Mary died at the young age of 28, It’s not known the cause of death but quite possibly an infection or disease and before modern medicine many died young. Fred was left with the 5 children so there must have been family help whilst Fred was working. In 1901 Fred was living at number 5 Carlow Road, but In the census of 1911 he had moved to a old cottage In Carlow Street and which dated back to the early 16th century and around the middle of 19th century the well known Ringstead family of the “Greens” lived here. Fred, now a talented shoemaker, started his own business from his house, not only making boots and shoes but he had also started to make sports footwear too. It was Fred who patented removable running spikes for running shoes – if he’d been living now he could possibly have made considerable money from something like this. There are no details of who he sold his patent to, but one day we might find out. His elder brother Nathanial, a member of Ringstead Cycle Club, took part in the Ringstead to London Bike Ride, a distance of 70 miles, with an Ernest Cottingham beating a Raunds man’s earlier attempt with a winning time of 16 hours and five minutes. I wonder how long It would take these days with professional riders - a little less I’m sure but still an amazing feat for the day. When Fred was 11 or 12 he too showed signs of being quite competitive and when he heard that two skaters from Northampton in 1891 were to attempt to skate the frozen Nene Valley from Northampton to Peterborough, a distance of over 30 miles, would have wanted not only see these two men come by the meadows near the mill, but to ride along with them, maybe just to Denford or Thrapston, he was after all a young boy. Fred was prepared for this day as he was a very keen skater from an early age. The men got as far as Wansford and before they had to stop at four o’clock with the lack of daylight. 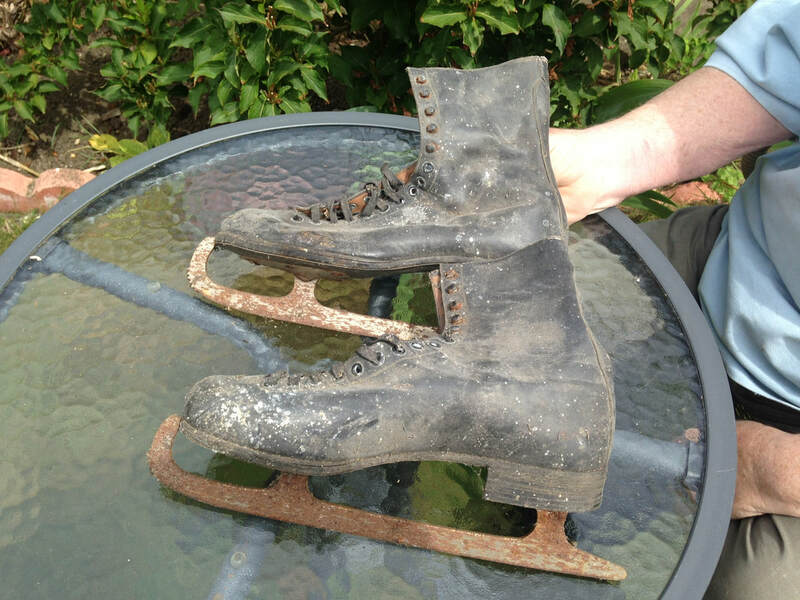 The boots he wore are still with us today and one pair of his skating boots have been donated by Robin & Deanna to the Village Heritage Group. When Fred was older his business was doing very well and he employed several men to help him with the work – probably a similar arrangement to modern shoe factories, with a different person completing each part of the process. Family members would take the parcels of various footwear on their bikes to the railway station at Ringstead where they would then be sent off to Wellingborough and Northampton, or even further a field. A proper Ringstead entrepreneur was Fredrick Fox. Fred wasn’t the only member of the family who had a good business sense because his granddaughter, Freda Fox, was the designer of BeBe Dolls which I’m sure most of you have heard of. It seems that Fredrick Fox stopped working around mid 60s years of age and died in 1954, another likeable, hard working character In our Ringstead Heritage,below Nathanial Fox. Ringstead elder Reg Hackney told me about past Cycle shop in Ringstead high street, the owner not only sold cycles he built them too in the early 20th century. His name was John Horace Gaunt son of Freeman Gaunt, it was Freeman that ran the Axe & Compass public house in Carlow road taking over from Thomas Green but Freeman Gaunt was Born at Bythorn in 1854-1895 and moves to Raunds at first then to Ringstead in 1891. John his son is born in Raunds in 1879 and works in a shoe factory and after work and at weekends being of a mechanical mind set about making cycles as his hobby, he meets Ringstead girl Kate Tilley of London End Road and gets married in 1897 at Thrapston. Once married they both set up home in 1891 along shop street, John leaves the shoe trade and sets up a Bicycle shop opposite the then Co-op in a row of shops which were demolished in the 1930s and replaced with the present council houses. It was from a local bicycle shop a particularly sad story of a young lady named Nellie Warren who hired a bicycle from the local bicycle shop with a friend to learn how to ride a cycle, she and her friend took their bicycles up to the top of Raunds hill (500 metres from the New Inn ) and descended the hill and for one reason or other didn't apply the brakes or the brakes failed and she crashed into a dray lorry delivering beer to the pub, she died within minutes. 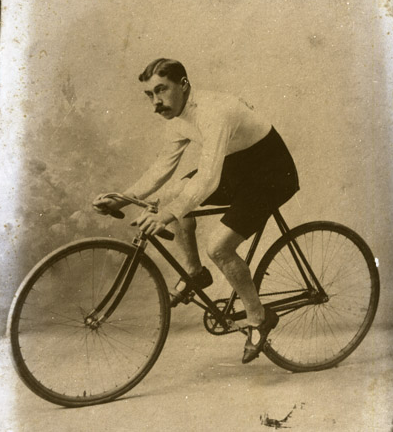 Doing the research for this information I noticed that John Horace Gaunt sister was Maud Estella Gaunt, she was married to Nathaniel Fox, Nathaniel at the age of 20 years old along with his friend Ernest Cottingham in 1891 rode to London and back to beat a record set by a Raunds man William Wheatley. They beat the record of Raunds man by well over an hour. I think it's only fair to say at this point that Ernest Cottingham was a cousin to Edward Cottingham of Ringstead, he was a master clock maker having his own shop in Thrapston and in the science museum London stands proudly one of Ernest's clocks. To end this small slice of 19th century Ringstead looking into these Ringstead names that Nathaniel Fox is Grandfather to friend Robin & Deanna Pentelow. In David Ball book's "Ringstead people" many of these names above have been covered in depth but I just wanted to know myself a little more on Ringstead Bicycle shop and how it started, I remember as a young keen cyclist around 14 years old many memories of having to cycle to Alan Jacques Bicycle shop in Thrapston high street to get parts for my own bike ! Happy days back then. 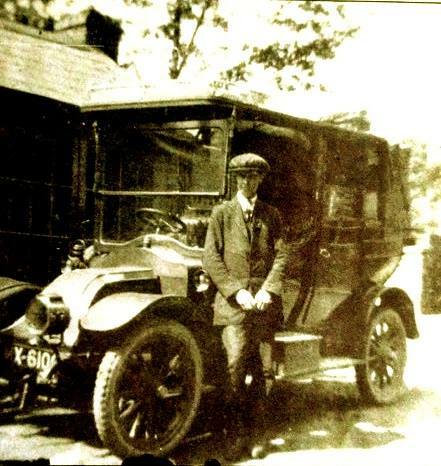 Attached is an image of Freeman Gaunt who ran the Axe & Compass pub proudly stands next to car quite possibly in the Axe car park. Image from Rance reviewed. 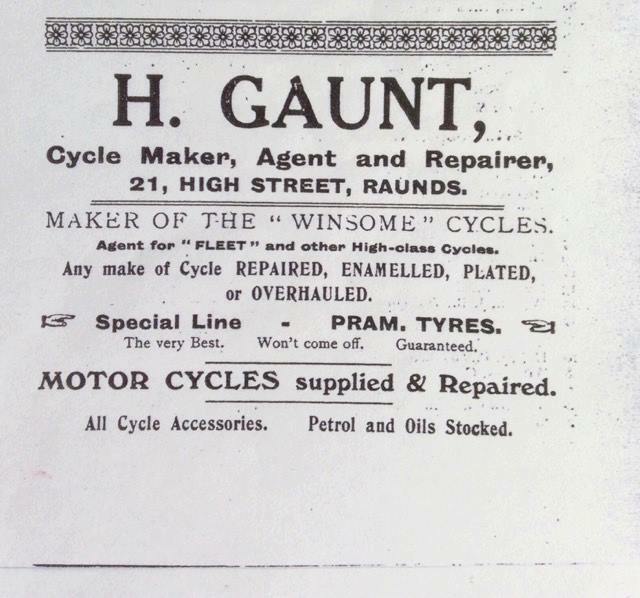 The poster tells of his second shop in Raunds. 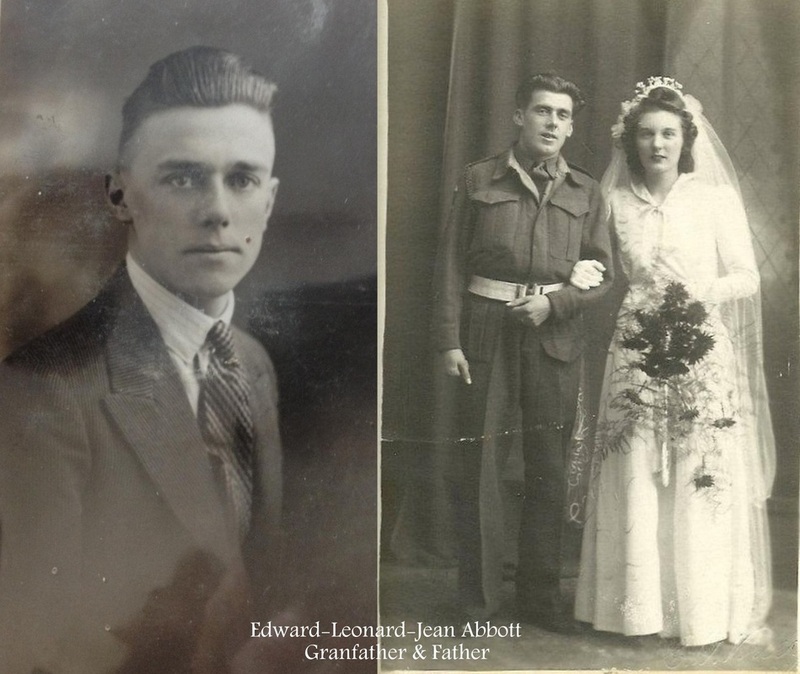 Private Edward ABBOTT 7th Batt. Sergeant George ABBOTT 9th Batt. Sergt-Instructor William Henry ABBOTT7th Batt. Private Ralph Owen EwartARCHER3rd Batt. 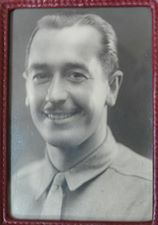 Lieutenant Henry William ATTLEY 3rd Batt. Private Walter BAKER 2nd Batt. Corporal Arthur Frank BARNARD 1/4th Batt. Private William Baden Powell BATES7th Batt. Private Cecil BELLAMY 2nd Batt. Private Charles William DAINTY7th Batt. Private Horace George DICKENS 15th Batt. Private David FARR 11th Batt. Private Percy FARR 11th Batt. Private Albert Ambrose FENSOM2/5th Batt. Private Charles Arthur MAJOR 6th Batt. Private James Henry MAJOR3rd Batt. Private Robert PENTELOW 8th Batt. Lance-Corporal Arthur James PHILLIPS 2nd Batt. Private Ernest Walter SAWFORDLight Cruiser "Caledon"
Rifleman Percy SAWFORD 5th Batt. Private William SAWFORD 1st Batt. Lance-Corporal Alfred Edward SHAW 32nd Batt. Private Sidney William SMITH1/4 Batt. Private Horace TILLEY 4th Batt. Private John Thomas WATTS6th Batt. Private Herbert Roy WEEKLEY 41st Batt. 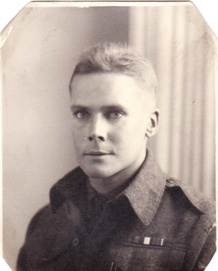 Private Leonard Samue l WITTERING 1st Batt. Private Evelyn WOOD 12th Batt. An Irish Bobby in Ringstead. Born in 1870 in County Cork Ireland Frederick Joseph O'Sullivan son of Jon & Mary O'Sullivan during his career had a good spell of living in Ringstead. 10 Gladstone street to be precise. Fred's family were very poor and still feeling the effects of the Great Potato Famine and in his late teens decides enough is enough and go where the work was, why he choose Naseby we will never know but its here he trains to be a Police constable in nearby Northampton, Fred, a burly six feet tall and heavily bearded man wouldn't have been a person you would like to meet up on a dark night in an Alley but by all accord he was a softly spoken well-mannered person. By 1894 & 22 years old after his training, he was bringing local criminals to court and we can see a selection of Newspaper articles mentioning Fred and the village of Naseby this is the time where he meets a young lady namely Charlotte Payne from nearby Kelmarsh. Late 1894 he marries Charlotte at Kelmarsh St Dionysius Church and she moves in with Fred at his police house in Naseby. During this time he has his first child Edwin at Naseby police house but then soon gets the orders to move to the sleepy Hamlet of Ringstead, but as you will learn it's not that sleepy. A whole year goes by living at number 10 Gladstone Street where we see Fred Charlotte Edwin are joined by a newborn, Henrietta. Ringstead mainly boot makers and farming village in the late 19th century had three pubs and a Beerhouse Cottage and needed to be taken under control as it had lost its last Constable, poaching, thieving and general nuisance makers were rife. By 1899 Frederick and family had settled in well and were well thought of ,he was policing the village exceedingly well but there was more news to come. Fred had to do service in the Boer war leaving his wife and two children behind. For a whole year, Ringstead had lost its police constable and was covered from time to time from officers from Raunds & Thrapston. Maybe the locals enjoyed this quiet police free spell, villans of the village maybe thought they could do whatever they thought "within reason"
Great news came upon the village a year later, Fred was on his way back by train , it was Saturday 27th of October at 7.40 in the evening Fred's train was to arrive at Ringstead Station. Over 200 parishioners gathered at the station and soon as the train came to a halt and the large figure of Fred stepped onto the platform there were cheers & chants, his wife rushed over two Fred gave him a big hug and kiss and again more cheers and hip hip hoorays could be heard all around the station. Even a horse and trap was layed on to take him back home to Gladstone street but according to the Mercury newspaper the horse was unleased and men grabbed the Wooden harness and started walking the cart up Station road, what a sight this must have been. Within days Fred had been reinstated as Ringstead Constable yet again and was back to his normal duty. He had decided to carry on fetching leather from Raunds factory Lawrence & co and continued stitching Boots along with his wife at their home in High street. This did not go down very well at all with the strikers of not only Ringstead but Raunds and Stanwick too. One evening over 200 boot & shoe operatives staged a protest outside his house, poor Fred was vastly outnumbered and had to call in backup from Raunds Thrapston and Irthlingborough. The rowdy lot were banging dustbin lids and almost anything that made a noise. The Roberts family must have been terrified, windows were being broken,chants of "come out here to be hung" were heard but with the police backup now in place the crowd were starting now to disperse and some men arrested with the names of Fred Phillips-Joe Archer-Ralph Mayes-Henry Major-Fred Fox and John Gray all were prosecuted for harassment at Thrapston court. As the years go by Constable Sullivan certainly had his share of policing the village and during his term at Ringstead Fred had five more children with Charlotte. In 1907 Fred gets his order to move on to the village of Nassington, a replacement Constable for Ringstead is taking place and the new officer moves into a house next to the Britannia Boot& shoe factory Denford road. Fred even if he had enjoyed his stay in Ringstead has no say in the matter which is governed from Northampton headquarters. From 1907 to 1911 Fred is stationed at Nassington police house and by 1911 he has a total of 11 children but three die very early in life. We then see Fred moves yet again to Bulwick police station, a tiny Hamlet near Kingscliffe and by 1914 Fred is retired from the force. We also see his wife Charlotte dies of Phenomena in 1925 and in an article in the Mercury its reported in 1928 that Fred and his wife and a child have a terrible accident in Oundle on his sidecar where it clipped the kerb and rolled over. Thankfully no one is badly hurt but his youngest son has cuts and bruises. We must presume he has remarried now. In 1938 aged 70 Frederick Sullivan dies of a heart attack and is buried next to his first love Charlotte. Thank you to Frederick Sullivan's Granddaughter who now lives in Ottawa Canada- Qwen Payne for sending census reports. Alfred Roberts was born in Ringstead in 1892, he went Ringstead school and he left at 12 yrs old and worked besides his father Benjamin a boot & shoe maker. From working in a tuck shop at the school he moved on to two other jobs as a grocers assistant. In 1916 he see’s a position of a shop assistant at Grantham, he soon works up to being a manager and then a owner of a shop,during 1917 he meets Beatrice his future wife. During all his time in Grantham he runs three grocers shops. Alderman Alfred Roberts, revered father of Margaret Thatcher and inspirer of her Victorian values, sexually harassed young female assistants working in the grocer's shop where she grew up, according to the distinguished political biographer Professor Bernard Crick. Writing in the satirical magazine Punch, the political theorist, commentator and biographer of George Orwell recounts claims from contemporaries of the one-time Methodist preacher, pillar of society and Mayor of Grantham, Lincolnshire, that he "was a notorious toucher-up". The assaults supposedly took place about 60 years ago, behind the counter of the shop, next to the "splendid mahogany spice drawers with sparkling brass handles (and) large, black, lacquered tea canisters", recalled in her autobiography by Baroness Thatcher, whose decisive endorsement of William Hague as Conservative leader last week has renewed her influence with the Tory right. "Older teachers," Professor Crick was told by a Grantham friend, "all remembered their difficulty in trying, good women, to steer girls away from taking jobs at his shop. They were frightened to hint at the real reason: for he was a figure of real power in the town." However, although tales of her father's alleged sexual misconduct might not have been known nationally, they have been common currency in Grantham for years, it was clear last week. Peter Hadlow, 76, lived next-door-but-one to the Roberts, and overheard many conversations about the scandal when working as an apprentice electrician. "Quite a broad spectrum of people said it. It was all over Grantham virtually," he said. "I would hear the boss talking about it. My ears were flapping - that sounds juicy, I thought. "These stories were bandied about, and eventually you begin to believe there was some truth in them. But he was an Alderman and so that sort of thing got hushed up. It was a question of who do you believe - a teenage girl, or Mr Roberts?" Mr Hadlow still lives in the same area of the town and added: "Funnily enough, when he gave up running the shop, he changed into a really nice bloke". More significant still were the comments of a 74-year-old woman from Grantham, who told the Independent on Sunday that she had been molested on frequent occasions by Alderman Roberts, when she worked in his shop, aged just 15. She said: "He was a bad one. He came round and put his arms around me, feeling my breasts. He used to put his tongue in my mouth. "I got quite frightened. I didn't like it and I'd push him away. He'd say nothing and go, but then he would come back again. He used to chase other girls round the counter." She worked at the shop for six months until she told her parents what was happening. Her father told her she should not return. The woman, who does not wish to be named, was then a chorister at the Methodist chapel where Alderman Roberts was a lay preacher. "One Sunday, I got up and walked out. I couldn't stand him standing up there and preaching," she said. 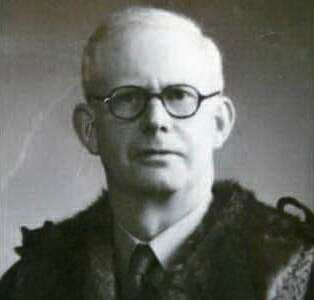 The rumours about Alderman Roberts took on fictional form in a novel about Thirties Grantham, Rotten Borough, written by local journalist Oliver Anderson and published in 1937. It featured a councillor who ran a corner grocery shop and was given to frolicking with his female assistants. At one point he is caught in flagrante beside the pork pies and polony sausages when a faulty light is switched on and passers-by see him, trousers down, through the shop window. 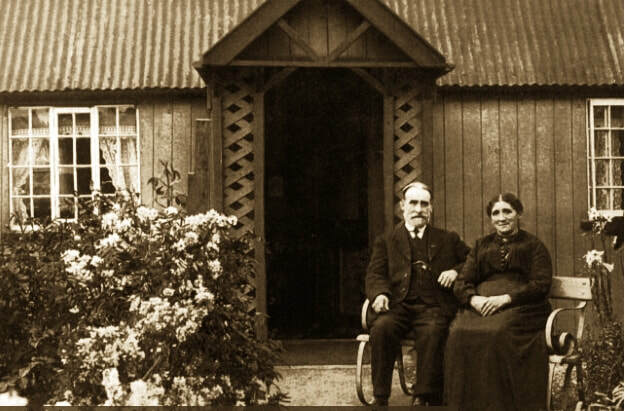 This is a photo of Arthur and Louisa Baxter outside their tin house which still stands next to Dodson & Horrell buildings Denford road but now owned by Chris Benham and used as an office..
Arthur Married Louisa at Keyston Church and it was in the village where he met Louisa, soon they moved to 11 Church street Ringstead and soon they had two sons,Percy & Herbert, when the boys were old enough they signed up during the great war and the sad part of this story is that both of them were killed in action. Arthur died in 1960, Louisa three years later. There was two othe Tin houses in the village. There was-May Cottingham at the top of Spencer street and Rosalie Abbott (aunt) who lived up Denford road where the Siggerays bungalow live. Originally a tin house. 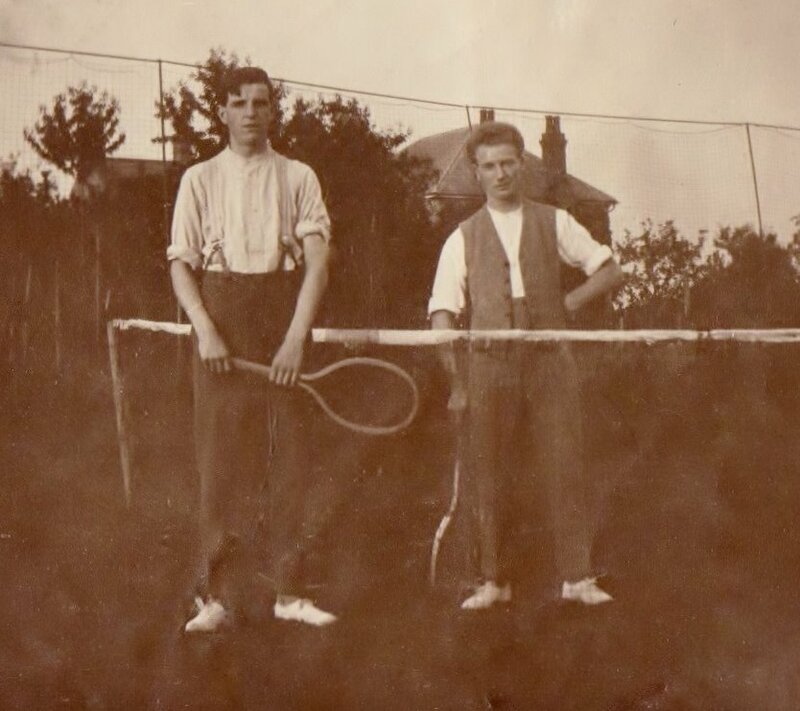 Sent in to me from Debbie Rimmington, Arthur Baxter seen here quite young and as you can see a very close match in looks to Debbie's Partner, Arthur was his 3rd great uncle. ​Arthur and Louisa seen here sitting on their bench outside there home.